The National Disaster Management Office (NDMO) is making sure it is ready for Tropical Cyclone Pam. NDMO director Akapusi Tuifagalele said although TC Pam was not expected to affect Fiji directly but it was still critical to prepare for the worst. “We’ve received preparedness reports from our divisional commissioners and series of meetings have been held with our head of departments and stakeholders,” Mr Tuifagalele said. “They have informed us the areas that they need assistance in and areas they are strong in so we can cover our angles”. He said they were readying their operation centres both at divisional and district levels. “And we continue to also work closely with the media making sure that we release as much information as possible to the general public,” Mr Tuifagalele said. Strong winds and continuous heavy rain is expected today and tomorrow. “We may have strong winds from the cyclone but the bigger issue is the flooding that will follow which will have a lot of impact,” Mr Tuifagalele said. He said strong winds will be expected for the western side of the country from Lautoka, Nadi, to Sigatoka and Suva and past Kadavu and Ono-i-Lau. “While other parts of Fiji will experience heavy rain the western side will face the full brunt of the strong winds,” Mr Tuifagalele said. The Republic of Fiji Military Forces (RFMF) is also now on alert. RFMF Land Force Commander Colonel Sitiveni Qiloho said they had already put in place a plan. As of 3pm yesterday, he said troops were on stand-by in Labasa, Lautoka, Nadi, Force Training Group in Nasinu and the 3rd Battalion Fiji Infantry Regiment (3FIR) in Suva. The troops he said were on a 30-minute call and this would mean they had to be ready within 30 minutes of the call from the RFM Headquarters. “There is another group on a two hours call,” he said. In Rotuma, he said an alert was sent to the engineers at Ahau who were building the new Rotuma Hospital. Logistics and a medical staff are also on stand-by to accompany the troops. Colonel Qiliho said the Navy was also on stand-by. The engineers he said were also preparing chainsaws and other machinery if needed. The RFMF is liaising closely with DISMAC. Meanwhile, the soldiers who were deployed to Qamea for the eradication of the American iguana had returned and they were in Savusavu yesterday. Acting Permanent Secretary of the Ministry of Agriculture, Uraia Waibuta said they had now activated an operation room at their headquarters in Raiwaqa. “Our teams are now ready with senior officers now being mobilized and are liaising closely with NDMO,” Mr Waibuta said. Farmers are advised to secure their properties and livestock. “For those who are living in flood prone and low lying areas it is advisable that they to start moving to higher grounds,” he said. The Council is calling on parents and guardians to keep their young, especially toddlers, away from rivers, streams, etc. As Cyclone Pam draws closer to Fiji and intensifying, the council is pleading with the public to stay away from rivers crossing, fishing, diving, bathing, washing, sailing, surfing, driving through flood waters, and driving during periods of heavy rains and strong winds. Fijians living Southwest of Fiji should expect heavy rain and strong winds from today. The Fiji Meteorological Service current update states that Tropical Cyclone Pam is expected to intensify further. Principal scientific officer Ravind Kumar said: “Tropical Cyclone Pam is expected to lie about 1050km Northwest of Nadi at 2pm tomorrow (today) and about 800km Northwest of Nadi at 2pm on Thursday. “At this stage the Tropical Cyclone Pam is not expected to directly affect Fiji but from overnight on Wednesday (today) and into Friday the associated active rain bands will bring rain heavy at times,” he said. The tropical cyclone continues to intensify and was upgraded to a category 2 system from yesterday. According to the Nadi weather office TC Pam is expected to continue intensifying and may develop into a Category 3 system. 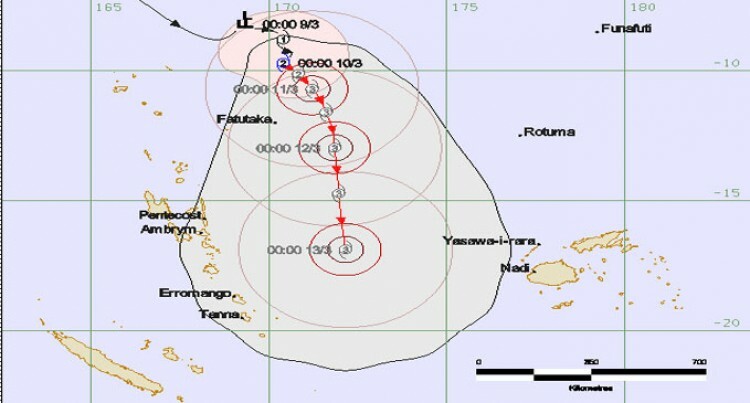 Rain bands and strong winds associated with an active convergence zone were expected to affect Rotuma from last night. “The tropical cyclone is expected to continue over the weekend,” Mr Kumar said.